I’m in Virginia Beach and flying back home this afternoon. I’m writing up a post of what I learned here. 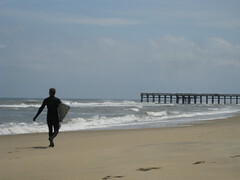 In the meantime, here is a photo of a surfer in front of the 6 bedroom mansion we did a home exchange with for a week. But, I wanted to tell you about where I’m off to next. I’m attending the Warrior Event in Austin this Friday, Saturday and Sunday. The Warrior Forum is the most famous gathering place online for Internet marketers to meet, trade ideas, and network. I’ll be hanging out with Craig Perrine the Maverick Marketer probably over a great bottle of wine and I’m going to dinner with Keith Wilke of Nitro Marketing. Come along. Hope you can make it. Say hi.